Such statements serve as comfortable cop-outs, essentially robbing otherwise talented individuals of opportunities for meaningful influence and impact. The fact is we don’t have to “wait and see.” We can plan and work. “Time will tell.” It will tell if we planned and executed well. And, finally, we will have to “cross the bridges” we encounter along our personal and professional journeys. However, the wise among us plan their routes carefully, intending to avoid as many unpleasant obstacles as possible. Here are some basic, common sense thoughts to consider if you want to know how to be a better planner. and social responsibility, to name a few. Each of these areas, as overwhelming as they may initially seem, demand special attention by all of us who call ourselves leaders. and when completion is expected. Strive for sustainable excellence, not unattainable perfection in the completion of these plans; and always have a realistic time schedule in place. Remember, these may be your plans, but there may be others better suited than you to institute some of them. Each is a management tool we learned as students to indicate, by comparative means, the extent of our progress (or lack thereof.) Now is the time to put these tools to good use. Time management gurus have conservatively estimated that for every unit of time spent planning, four or more units of time are saved in actual plan implementation and performance. In other words, if an hour, a week, or a month is spent planning a job or activity, one can reasonably expect to save four or more hours, weeks or months once you get started doing the job. I have found that most jobs are not that difficult to accomplish – it’s just difficult to get started on them. So, carve out some planning time now and then go to it! 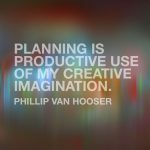 Posted by Phillip Van Hooser in Planning, Success.